Ticket King Milwaukee has Jimmy Buffett Alpine Valley tickets available for his concert on June 25th. 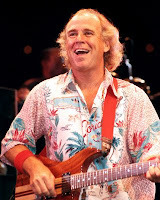 Jimmy Buffett's concert will kick off Alpine Valley's 2011 season. There are few things in life that you can count on these days, but one thing is for certain--Jimmy Buffett will tour the country and personally invite you to Margaritaville. Be a cheeseburger in paradise and treat yourself to Jimmy Buffett at Alpine Valley tickets. You won't regret it. Also, don't forget to remove your favorite floral-patterned t-shirt from storage. You're going to need it for this event.